Our 30 years of experience in growing Christmas trees culminates in developing and shipping top quality trees and wreaths. Customer satisfaction and service are a top priority with every shipment. Being smaller growers allows us to provide personalized attention to all our customers and help them with their specific needs. 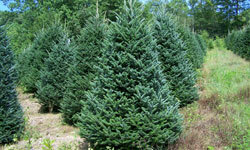 We have trees available from 4 ft. to 12 ft. and we encourage our buyers to visit our farms and tour the fields. Please give us a call to set up a time for a visit. We make our own wreaths and have them available in sizes ranging from 18” to 54”. For more information, contact us at 828-964-8463, 828-964-8463, 828-964-6322, email us, or use our online request form.